Kao Men’s Bioré has also appointed Zulfahmi Khairuddin, Malaysia’s Moto3 World Motorcycle Grand Prix racer, as its brand ambassador. Zulfahmi’s young and fresh look as well as his inspiring performance in Moto3 championships makes him a great role model and a reflection of Men Bioré’s standards. 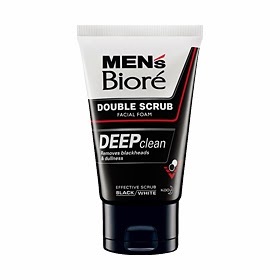 •Double Scrub Deep Clean contains Black and White Scrubs that effectively removes blackheads and exfoliates dead skin cells for clean, oil-free and healthy skin. •Double Scrub Deep Clean Extra Cool has a similar function as the Double Scrub Deep Clean but offers an extra cool and refreshing sensation after every wash.
•Double Scrub Oil Clear contains Green and White Scrubs as well as Black Tea that effectively removes excessive oil from the skin for shine-free skin. It also gives the skin a cooling and refreshing sensation after every wash.
•Double Scrub Bright Clean contains not only the Black and White Scrubs but Charcoal as well that works together effectively to exfoliate dull and dead skin cells for visibly bright and even skin tone. The new Men’s Bioré Double Scrub Facial Foam retails at RM13.90 (100g) and RM7.50 (50g). Men’s Bioré Double Scrub Facial Foam range is available at all major retailers, pharmacy, hypermarkets and provision shops.